You would have to stay here a LONG time to see all of the 78 hiking trails in the Sedona area. And they are all beautiful! The Teacup trail looks like a garden. The Jordan Trail is one of my favorites. I like trails that have a view, where you do not hike among tall trees. The Jordan Trail connects with the Cibola Pass Trail to form a loop. Where if you're brave, you can walk right out onto the natural bridge. 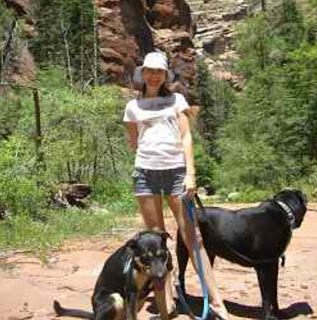 and Bree and their 2 dogs, of Operation Tally-Ho. I was just so impressed that these "youngsters" would even think about fulltiming, and have the initiative to do it. Check out their blogs - they're both terrific. Probably the most photographed site in Sedona is Cathedral Rock. After paying $9 to see it (even if you have a pass), it better be good! This was the view from the first set of tripod holes (and photographers) I came to, but I just knew it wasn't the best view. Although this cute little duck was an added bonus. I continued down the trail. This is the classic shot, with the rocks known as Red Rock Crossing in the foreground. Early settlers forded Oak Creek here. The trees around the crossing have gotten larger, so it's necessary to get in the creek to get the shot. I came prepared with my Tevas, and soon shamed some other photographers into getting wet. A little farther down the path was another great shot. Again, I had to get my feet wet, but this time I wasn't the only one. Farther along was an "artist" with his work-in-progress. This time with a Great Blue Heron joining in the fun. This was a real winner - a pool with a reflection. On the way back to the parking lot, I went by an old water wheel from the 1930s. And yet another shot of Cathedral Rock with an old building in the foreground. So, what have we learned here? The first shot you see is probably not the best! I've really enjoyed my spring in the Phoenix area, but it's gotten too hot even for me. But before I left, I made one more trip to find the perfect saguaro cactus bloom - this time to Canyon Lake. And I think I found it! Thanks to the droopy arm on this guy, I can get a picture without a 20-foot ladder. I moved up to Sedona, parking in the spot the WINs were in 4 years ago, on FR525. Unfortunately, this balloon company did not like that there were RVs parked there. So at 5am, they parked 3 feet away from each of the 3 rigs there, and blew up their balloons. This parking area is bigger than several football fields, and there was no reason for them to park so close! We gave up and moved to a different location, and then went on a great hike. Doe Mountain was recommended by the guy at the Visitor's Center. It was a great hike. Some of the trail was a bit unique. And the view from the top was spectacular! Whenever a nice day happens, I try to do something outdoors. Phil, Barbara and I went on another hike by the Superstition Mountains, this one starts where FR78 (First Water Rd) meets AZ88. You can walk right up to the base of the Superstitions. Lots of cactus were in bloom, again with no shortage of pollen. But I'm still trying to get a good picture of a saguaro bloom. Unfortunately, they're all at least 20 feet in the air. Pretty good, but I'm still not happy. But don't worry, I won't give up! This guy's waiting for the show too. I think this is some kind of Thrasher - anyone know for sure? Back home, there are lots of Gambel's Quails running all over the park. I'm surprised I haven't seen any babies. And I finally got a picture of a male hummingbird. Most of the time the males won't land on the feeder. Believe it or not, I'm actually getting ready to leave town and head for higher elevations. About time, huh? I love going to zoos, and taking pictures of the animals. I know it's kind of lame to take pictures of animals in cages, but I like it anyway. These turtles were in a pond outside the entrance. Apparently, everyone drops off their unwanted turtles here, and the place is being overrun. One problem of taking pictures at this particular zoo is that all the animals are in the shade. But who can blame them? The Phoenix Zoo is nice because it's just the right size. But it has a long way to go to catch up with some of the zoos I've been to recently, like St. Louis and Omaha. Both the tiger and the lion were in fairly small enclosures. But this little Andean bear (aka Spectacled Bear) had a huge complex all to himself. Apparently, he has a rich sponsor. Then hightailed it back to the shade. They had several giant tortoises from the Galapagos Islands. Not sure if I've ever seen them before. The California Condors were pretty unusual. They have a wingspan of 10 feet! I just love the prairie dogs - soooo cute. I got a glimpse of the Bighorn Sheep far in the distance. I probably could have walked up a steep hill to get closer, but isn't that what zoom lenses are for? This unusual monkey is a Mandrill from Africa. His bright coloring helps him attract females. But this little monkey was the funniest. He really wanted to interact with the kids on the other side of the glass. Wonder how much they pay him to pose?